In the first-ever nationwide random survey of American Muslims, the Pew Research Center analyzed interviews with more than 1,000 Muslims nationwide that probed religious practices, political views and demographic background. The resulting survey paints a detailed picture of a new American population that is both highly assimilated and unhappy with the ongoing war on terror. 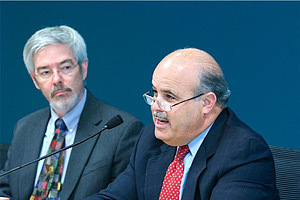 Andrew Kohut, president of the Pew Research Center, and Luis Lugo, director of the Pew Forum on Religion & Public Life, who jointly oversaw the project, presented the study’s key findings to a group of journalists, who either attended the event in person or participated by telephone. Also present to comment on the study were Scott Keeter, the survey’s project director, and Amaney Jamal and Farid Senzai, who served as project advisors. ANDREW KOHUT: Thank you for coming to hear about our Muslim American poll. It is one of the most rigorous surveys the Pew Research Center has ever conducted. It uses all of the skill sets of the Pew Research Center, requiring polling expertise, religious expertise and demographic expertise. I want to welcome the reporters who are in the room and also the reporters who are on the telephone. 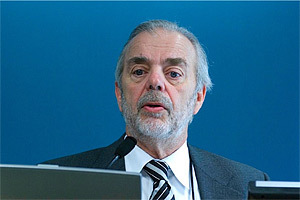 I’m Andy Kohut, president of the Pew Research Center. 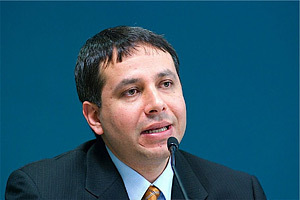 Joining me to discuss the poll will be Luis Lugo, director of the Pew Forum on Religion and Public Life. Scott Keeter, who is director of research, is also here. He is going to be answering the very tough questions about our rigorous methodology, questions that Luis and I are going to duck. We have two of our principal consultants joining us as well: Amaney Jamal, who is an assistant professor at Princeton and an expert on Muslim and American political engagement; and Farid Senzai, who is a fellow and director of the Institute for Social Policy and Understanding and also a professor at California State. Let me begin with a description of what we’ve done. This is the first-ever nationwide random survey of Muslim Americans. In the course of doing it, we conducted 55,000 screening interviews to identify a national sample of 1,054 Muslim Americans. Besides interviewing in English, the survey was conducted in Arabic, Farsi and Urdu. I think that’s a first-ever as well. Most of the Muslim-American surveys have been conducted in English only. This is mostly a middle class and mostly mainstream public. We draw that conclusion from half-hour interviews. We find the Muslim Americans we interviewed largely assimilated. They’re happy with their lives. They’re moderate on many of the issues that sharply divide Muslims and Westerners around the world, and doing this survey we draw upon results of our surveys of Muslims in Western Europe and in countries of the Middle East and Asia. We have quite a perspective, using questions in this survey comparable to questions we’ve used in these international polls in the Global Attitudes project; clearly this public comes across as much more moderate than Muslim publics in much of the world. This is a highly diverse public. Two-thirds of the people we interviewed were foreign-born. Arabs, Pakistanis and other South Asians make up the largest percentage of the foreign-born population. Native-born Muslims are 35 percent of the public, and they are mostly converts. They weren’t born as Muslims. African Americans make up 20 percent of the Muslim American public, and two-thirds of the native-born public. So the native-born public is dominated by African Americans. Given that the U.S. census does not ask religious identification, there is a real debate about how many Muslim Americans there are, and we can enter that debate with the results of our rigorous survey. Our survey projects 1.5 million adult Muslims, 18 years of age and older. In percentage terms, that’s 0.6 of a percent. That’s a little bit higher than most other sample surveys, which have ranged from 0.2 of a percent to 0.5 of a percent. Our new data, when combined with the Census Bureau data on immigrants’ nativity and nationality, puts an estimate of the total population at about 2.4 million. Again, these are approximations, and this obviously will not end the debate about how many Muslims there are, but we have some good information to add to the range of estimates made by other organizations. More generally, the poll finds that Muslim Americans, even though they are largely foreign-born – and if you take into account first and second generation, overwhelmingly newcomers to the United States – nonetheless they’re decidedly American in outlook. Seventy-two percent of them take the very American point of view that with hard work you can get ahead and succeed in this society. That’s an even larger percentage than the general public. Consequently, the income levels and education levels of Muslim Americans are at the national mean. Unlike Western Europe, they are not a small minority who are less well off and frustrated with economic opportunities and, to some extent, socially isolated. This is a group that is living as most Americans are – we find Muslim Americans to be highly assimilated. Most report that the largest proportion of their friends is non Muslim. On balance they believe Muslims who come to the United States should try to assimilate and adopt American customs rather than trying to remain distinct, or they feel they should do a little bit of both. Most do not see a conflict between being a devout Muslim and living in a modern society. So another one of the major findings is this is an assimilated group or a group that at least aspires to assimilation. Muslims in the United States reject Islamic extremism to an even greater extent than do Muslims in Western Europe, and to a much greater extent than Muslims living in the Middle East and Asia. Compared to Muslims elsewhere, very few believe that suicide bombings that target civilians in defense of Islam can be justified. The percentage is about 5 percent. In some countries it’s been as high as 50 percent. Two or three years ago, for example, in Jordan, that question registered at about 50 percent, and it fell dramatically after the Amman bombings to 25 percent. But even at 25 percent, it’s five times as great as what we see in the United States. Just one in 20 of the people we spoke to expressed a favorable view of al Qaeda, far lower than percentages in many of these other Muslim countries. But, indeed, the poll did find pockets of sympathy for Islamic extremism. Among younger Muslims, we found a combination of attitudes that included a greater propensity for younger Muslims to self-identify as Muslims rather than as Americans, more religious observance, and – this is all relative to older Muslims – also a much-higher-than-average expression of support for suicide bombing. Fifteen percent of the Muslims under 30 years of age said that suicide bombing could be justified “often” or “sometimes.” That compares to less than 5 percent among Muslims over 30 years of age. This pattern of younger Muslims expressing more sympathy or acceptance of the possibility of suicide bombing was also something we saw in Europe, where younger people expressed more sympathy for extremism than older people. The poll also found an unexpectedly small number of African Americans having highly unfavorable views of al Qaeda. Only 36 percent of the African Americans had a high unfavorable view of al Qaeda. That compares to more than 60 percent among the rest of the Muslim public. African Americans, however, were not more likely to think that suicide bombing could be justified, and I think this finding, from my own personal point of view, reflects more a measure of their alienation. They are clearly the most disillusioned segment of the Muslim American population. They’re far less satisfied with the way things are going in the country. They have lower incomes, lower education levels. They’re much more skeptical that hard work in this country really pays off, and more of them believe that Muslims coming to this country should try to remain distinct. So we have those two things going on. But overall this is a very, very positive story for the vast majority of Muslim. However, I have to tell you the Muslims we spoke to weren’t only telling us positive things. We found 53 percent saying it’s more difficult for Muslims to be Muslims in the post-Sept. 11 world. Most believe the government singles out Muslims for increased surveillance and monitoring. Few Muslim Americans, relative to the public at large, believe the war on terror is a sincere effort. So while this is a satisfied public and a mainstream, moderate public generally, there is a lot of pushback on how the war on terrorism is affecting Muslims here in the United States. Consistent with views of Muslims around the world, we did not find a majority of American Muslims saying they believe a group of Arab men carried out the Sept. 11 attacks. We only have found 40 percent expressing that view. This question was first asked by Gallup in January of 2002, right after the attacks, all around the Middle East. That survey shocked many people: it showed a vast majority of Muslims in places like Turkey or Jordan did not believe Muslims and Arabs had actually carried this out. We repeated the survey last year in our Global Attitudes poll, and surprisingly we found not much movement from what Gallup found back in 2002, even though Osama bin Laden had proclaimed responsibility for the attacks. There’s no question Muslims around the world are reluctant to say, or do not believe, that a group of Arabs carried out these attacks. A little analysis of the data suggests it has something to do with religiosity. The more religious Muslims were less likely to say Arabs carried out this attack, perhaps because, as some of our consultants have suggested, they find it hard to believe Muslims could do such a thing, although we also found a relationship between support for suicide bombing and the belief that Arabs did not carry this out. It’s a little hard to understand what that relationship means, but there are lots of things in this poll that will require further study and analysis and speculation on the part of experts. That’s one of the reasons why we’ve make this data set available, to better understand the views and attitudes of Muslim Americans. Luis, would you pick up the story from where I left off? LUIS LUGO: Absolutely. The survey paints a very interesting demographic and religious portrait of the Muslim American community. On the demographic front, three major things emerge here: first, this is a very diverse community. We have identified Muslims from some 70 countries – 68-plus – in this survey. I would imagine that next to the yearly pilgrimage to Mecca, the Hajj, this has got to be one of the most representative Muslim communities anywhere in the world. We think that’s quite significant. No ethnic group predominates. Again, unlike Europe, where large numbers tend to come from a single destination – Moroccans in Spain for instance, or Turks in Germany – there is no single group that has more than 8 percent of the overall Muslim population. That would be Pakistanis and Iranians – they each comprise 8 percent of the Muslim population, respectively. The population also very diverse racially, as well as in the regions from which they come. Secondly, they are very recent in terms of a population. Sixty-five percent, as Andy mentioned, are foreign born, and the vast majority of these, some 84 percent, have been here only since 1980. So it is a very recent immigrant population. Add to that the 21 percent who are converts, and you’re speaking of roughly nine out of 10 Muslim Americans who are recent in terms of either being Muslim or being American. Despite that, they are very mainstream, generally mirroring the population, as Andy mentioned, with respect to education and income – again, in stark contrast to Muslims in Europe and other immigrant groups in this country such as Hispanics. Despite the heavy presence of recent immigrants, they have very high rates not only of accepting American values but also of citizenship. Seventy-seven percent overall and 65 percent of Muslim immigrants are citizens. Of those who arrived prior to 1990, 92 percent are citizens. That’s about 30 percentage points higher than among Hispanic immigrants to this country. Even among those who came in the ’90s, 70 percent are citizens. Clearly this is not a guest-worker population in the European model; these are folks who are coming here to be part of American society, including becoming American citizens. The religious portrait that emerges here is also interesting. Religiously speaking, the bottom line is Muslim Americans are very much like the rest of the country, and they’re so in three basic ways. First, their religion is very important in their lives. In that sense they are reinforcing the generally religious character of American society, even as they are diversifying it away from the traditional Christian immigration into this country. This was reflected in everything from mosque attendance to daily prayer to the reading of the Koran. Secondly, like most religious Americans, Muslim Americans do not see a conflict between being a devout Muslim and living in a modern society like the United States. Somehow religiosity and modernity are coming together for this community as it is for Christians in this country. Most do not believe Muslims in the U.S. are becoming less religious. Seventy-four percent believe they’re either not changing much in terms of their religious identity or actually becoming more religious. Again, this is a pattern we see in other immigrant communities. 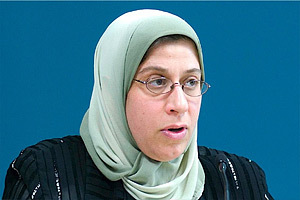 Thirdly, as in American Christianity, there are considerable internal differences within the Muslim American community, including what we might call denominational differences – a Sunni, Shia distinction – but also a significant number of people who, if we were speaking of a Christian community we’d call nondenominational Christians. I was quite taken by the fact that 22 percent identify themselves as “just Muslims.” That was, by the way, an offered response, which makes it even more interesting. There are also different levels of religious commitment. If you look at mosque attendance, for instance, those under 30 tend to be much more regular in their attendance, as Andy mentioned. This is the flip side of what we see in the Christian community in this country where those under 30 attend church less frequently – much less frequently – than those who are under 55. In the Muslim community, it is the reverse. We also see significant differences among ethnic groups. Among Pakistanis, for instance, 57 percent attend mosque at least weekly. Iranians are on the other end. I affectionately call them the Cubans of the Muslim American community; in our Hispanic survey, Cubans came out more secular than other Latinos. Among Iranians, only about 7 percent [attend a mosque at least weekly.] That’s a 50 percentage point gap. That’s diversity. Finally, Muslims Americans also reflect the very dynamic religious marketplace that is the United States. Twenty-three percent of all Muslims are converts to Islam in this country, and 95 percent of those are native-born. That’s a brief portrait, both demographically and religiously, of the Muslim American community. AMANEY JAMAL: The findings of this survey give an important picture of the overall Muslim American population, which is a population we’ve been only able to speculate about or base our understanding on a limited number of surveys. This is a groundbreaking project in all its aspects. What emerges from the study is the great success of the Muslim American population in terms of its socioeconomic assimilation and integration. In many respects, the population mirrors that of the mainstream American population. Given the fact that for the past six years Muslim Americans have been dealing with the backlash of 9/11, these numbers are extremely, extremely impressive and will be of value to Muslim American scholars and community organizations. However, the majority – 53 percent – in the Muslim community says life is still much more difficult after 9/11 than before. Fifty-four percent feel the existing war on terror singles out Muslims, and 74 percent, a vast majority, are bothered by this. So on the one hand, yes, a very successful population; on the other hand, they still feel they’re on the receiving end of unfair treatment since 9/11. This raises important questions: how does a minority community on the one hand embrace its success and American identity while simultaneously dealing with a mainstream that still views it as a potential enemy? When we asked Muslim Americans in the survey what they considered to be the most important problems they face on a daily basis, 60 percent responded along the lines of misunderstanding, if you lump their answers together. The key issues cited were a lack of knowledge about Islam [among non-Muslims;] stereotypes continuing to affect the Muslim community; people having unfair perceptions of the Muslim community; and the continuing allegations that Muslims are linked to terrorism. Sixty percent of the responses can be grouped in this dimension. This is a population that by all socioeconomic measures is moving towards assimilation, integration and a multicultural understanding of their own citizenship and placement in the society, yet there is still this overwhelming feeling that the mainstream society does not accept them, doesn’t know enough about them, and doesn’t understand their religion. What will be of great reassurance to the Muslim community is that when we examine support for extremism among the Muslim population cross-nationally, we find that Muslim Americans, by and large, reject Islamic extremism. Support for suicide bombings among American Muslims is the lowest among Muslim populations worldwide, as is support for al Qaeda. This raises the question of what it is about the American Muslim population that enables it to be less supporting of these extremist ideologies. The notion of Islam being a monolithic religion that by default supports extremism is not substantiated by what we’ve found here in this Pew study. This is a very important and impressive finding. We also find significant variation here within the United States. As has been highlighted by Andy and Luis, we find that support for extremism among the youth population is significantly higher than the average Muslim population. What explains this variation? What is it about the Muslim youth in the United States, as well as Muslim youth worldwide, that they are more likely to support Islamic extremism? Is it a youth phenomena? Is it something about the way youth embrace Islam? Is it something about youth exposure to video games and violence? These are the types of questions we need to investigate as we move forward and think about the implications of these findings. Another significant finding in the Pew study is a strong commitment among Muslim Americans towards issues of social justice. Muslim Americans believe government has a very important role to play in terms of generating equality or providing welfare and other services. Muslims are more likely to support government playing a more important role in terms of providing services to the general population. We also find that although Muslims by and large feel the war on terror singles them out unfairly, and they are less likely to believe the war on terror is a sincere effort to counter terrorism, they’re worried about Islamic extremism worldwide and in the United States, which shows, again, the feelings of precariousness among Muslim Americans. On the one hand, they believe that the war on terror singles them out, and they also worry about the rise of Islamic extremism, which would also single them out. There is lot of fear in the Muslim community that if a repeat of 9/11 occurred, the community would not be able to sustain itself any longer. The desire to balance these two phenomena is an issue on the minds of Muslim Americans, and one we’d like to investigate more closely as researchers in the community. FARID SENZAI: The news overall, as has been pointed out by our previous speakers, is overwhelmingly positive. The Muslim community in the United States is clearly different from the Muslim community in Europe. It is less ghettoized here in terms of integration with the broader American population, while in Europe we see ghettoization taking place, as a result of differences in both education and income levels, and because of pockets [of extremism] that exist within Europe that do not exist here in the United States. 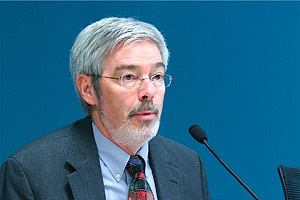 As Amaney pointed out, the overwhelming number of Muslims surveyed shunned and criticized Islamic extremism, but there is concern that there is a small minority, found within the youth within the Muslim community, as well as within the African American Muslim community, that have either supported or tacitly justify some form of extremism, including suicide bombings. One could speculate as to why that is, and we can get into that in the question and answer period. From my own research into this issue, there is a pendulum effect for many youth. As they enter universities and begin to form their identities, they are influenced by peers as well as sources outside the mainstream Muslim community. Often their information comes from the Internet, for instance, and that information often radicalizes them or moves them toward more extreme positions. It’s the source of the information that is the reason for that. In terms of foreign policy, it’s interesting to note that Muslims, even though they are politically liberal, are socially conservative. Consequently their positions tend to be politically to the left – voting for John Kerry in the previous election, for instance – while on the other hand being very conservative on social issues. The war on terror is another major concern for the Muslim community. They feel the war on terror is not justified, and that in fact it will not achieve its aims. They are also concerned about the war in Iraq. Those are some highlights from the study, but clearly many new questions arise, which will require further investigation. DAVID MORGAN, REUTERS: Does the stronger Muslim identity and stronger support for extremism among Muslim youth suggest that changes may be taking place within the Muslim community? To what extent does this appear to be a response to the war on terrorism and the invasion of Iraq? JAMAL: What the report does find is that Muslim youth tend to have a stronger Muslim identity, and they also tend to be more likely to support suicide bombings. One can easily extrapolate, then, that there is a correlation between Muslim identity and support for suicide bombings. But we would need to subject that correlation to more rigorous analysis, controlling for a variety of issues – income, education, length of stay in the U.S. – to really get at the causal mechanism. MORGAN: What I’m asking is whether there appears to be a generational change in the making. JAMAL: If there is a generational change in the making, one that’s specifically in response to the war on terror, we would expect to find it more pronounced in the West than in the Muslim world. That’s what we are finding. The youth in Western societies are more likely to support extremist tendencies. Whether it’s about Muslim identity per se, or about religious observance per se, I don’t think we can make that inference. The youth population is more likely to attach itself to a mosque in terms of mosque attendance, but mosque attendance in the U.S. is also about sustaining social identity, finding friends; it’s a meeting place for Muslims where they feel safe. So it could be generational. It could be also that the youth population enters mainstream society with the highest expectations. They feel that if they do all the right things, they should be accepted by the mainstream, and when they find the mainstream still has negative opinions about the population, they might be resorting to these in-group identity markings. That’s one hypothesis. A second hypothesis is – let’s also remember that the youth population is the key population that has been subjected to the post-9/11 scrutiny: stereotypes, name-calling. All the “Osama” slang has impacted the youth population disproportionately. These are all hypotheses; they are not substantiated in the data, I’m just speculating. Certainly more research needs to be done. KOHUT: I’ve got a somewhat different answer to that. Inasmuch as the same pattern of younger people being more inclined to support suicide bombing exists throughout Europe, I would suggest it probably has something to do with the fact that young people tend to be inclined to violence to a greater extent than older people. You are seeing a pattern that reflects youth perhaps as much as any potential cohort change. You find me a war we’ve tested public opinion about, and I’ll find you a profile where younger people are more in favor of it than older people. These are all hypotheses, but a lot of data suggests this is not just the United States. In that regard I would see it as a youth phenomenon – kind of a strange thing to say about something as heinous as suicide bombing, but that’s what the data suggests. SENZAI: If I could just add: this justification is not to suggest that Muslim youth in this country are about to go and mount suicide bombings themselves. It’s not something they see themselves engaging in; it’s more an issue of seeing what’s happening abroad and not having the ability to provide nuanced solutions in terms of foreign policy, and consequently feeling that in these situations, suicide bombings are justified for others because of the occupation, for instance, that exists within many Muslim countries. They’ve been able to justify it as a last resort since they feel there is no other solution against an asymmetrical and militarily stronger occupying force. LUGO: Just to add another bit of complexity to that. When you look at the numbers on personal satisfaction, this group under 30 is by no means alienated. You get the highest levels of personal satisfaction in that age cohort. This is not reflecting some bout of existential angst that leads to support for terrorism. It is a complex picture indeed. EDWARD LUCE, FINANCIAL TIMES: Could some of the differences in attitudes you find between Muslim Americans and Muslims in Europe be attributed to the small scale of Muslim immigrants in the U.S.? Six-tenths of one percent compared to five to 10 percent, and the fact that you’ve got them from 58 countries as opposed to one or two or three countries in places like France and Germany – Is that part of the explanation, or is it something more intrinsic to the nature of Europe and America that would explain this? KOHUT: First of all, the United States has a long history of being great at assimilation, to a much greater extent than European countries. The percentage of Americans who, even in this period, are inviting and open to immigrants is greater than in other parts of the world, particularly Europe. Plus the conditions are different, and the environment is different. There is a wonderful table at the end of the “overview” that shows how parallel Muslim Americans are to Christians with regard to their religiosity, which is what Luis was pointing out. On that basis alone, this is a more inviting environment for religiously observant Muslims than secular Europe. It is hard to find a characteristic that accounts for the differences we see – it’s not only the size of population; it’s the general receptivity of the American public, and it’s also the kind of country this is in religious terms relative to Europe. LUGO: And it’s 68 countries, by the way, not 58. MARGARET BESHEER, VOICE OF AMERICA RADIO: Did you ask recent immigrants what drew them to come to the United States in the first place? And of American-born converts to Islam, did you ask them what it was about Islam that drew them to the faith? SCOTT KEETER: Yes, we asked in both cases, but on the question of conversion, we didn’t get a lot of texture. The bulk of the answers had to do with the attractiveness of the faith and its beliefs and examples of people they knew who they admired or who had told them about the religion. A majority – almost six in 10 – of those who converted said they had done so for reasons having to do with the religion itself. We also asked people who came to the United States why they had done so, and for that one we did extensive testing of the questionnaire in advance to find out the kinds of things that people would say, and then we gave them categories – educational opportunities, economic opportunities, family reasons, or to escape persecution or conflict in their own countries. Interestingly, about equal numbers of people gave each of those as reasons for emigrating. Among the foreign-born, a quarter – 26 percent – said it was for education; nearly a quarter – 24 percent – said economic reasons; 24 percent said for family reasons; and 20 percent said to escape conflict or persecution. Al-HUSEIN MADHANY, ISLAMICA MAGAZINE: Were Muslims polled for their willingness to participate in the U.S. government, whether at the local, state or national level, or to serve in the military? KOHUT: I’m not sure I understand that question. MADHANY: What was the willingness on the part of those polled to participate in government? KOHUT: Scott, did we have any questions about that? KEETER: We did. We measured whether they turned out to vote or not, and levels of voter turnout were pretty high, given the fact that not all of them were citizens who would be eligible to vote. It’s a younger-than-average population, and we know that among non-Muslim youth in America, there were lower levels of turnout. The only question we asked directly on that was a question at the very beginning of the survey. We started the questionnaire off with things that were not related to religion, just to put people at ease, and one of the questions was, “Have you ever run for public office?” Four percent said that they had. We haven’t recently asked that among non-Muslims, but my guess is that the number would be comparable: one in 20 or thereabouts. HEATHER YAMOUR, KUWAIT NEWS AGENCY: Did you poll Muslims on their views of the sectarian violence between Sunni and Shia going on in regions like Iraq? KOHUT: We asked no questions about Sunni-Shia violence. That’s correct, Scott? KEETER: We asked approval or disapproval – basically right decision, wrong decision – on the war in Iraq and Afghanistan. The only question where we asked about conflict in the Middle East was about Israel. LUGO: The results on that are very interesting indeed. I was personally quite surprised that a solid majority of American Muslims believe you can both guarantee Israel’s right to exist and guarantee the rights of Palestinians, which is quite remarkable and quite a contrast to what one finds elsewhere among Muslims. KEETER: A comparable number to U.S. non-Muslims. LUGO: Precisely. On that question, very similar to the American public as a whole. ALAN COOPERMAN, THE WASHINGTON POST: Do you have a cross-tab on the question about support for suicide bombing for African American Muslims? KOHUT: Yes, we do, and the levels are comparable to the national level. They’re not any higher. Even though African Americans did not voice as strong disapproval of al Qaeda as did other Muslims, they did not express higher levels of support for suicide bombings, or high levels of potential justification for suicide bombing. COOPERMAN: Secondly, on the political question: it was very interesting that Muslim Americans reported overwhelmingly voting for Kerry the last time around, but I recall in 2000 there were some exit polls that suggested there was high Muslim voting for Bush his first time around. You didn’t ask people how they voted in 2000, and don’t have any way to figure out whether in fact there was a flip there, correct? KOHUT: No, no. The only voting questions we had were for 2004. COOPERMAN: Is there any other way of determining whether Muslim voting for Democrats in 2004 is part of a long-term pattern and a solid leaning or just a reaction to the war in Iraq and the current situation? One thing we haven’t mentioned here about Muslim attitudes toward foreign policy is that while Muslim Americans agree with other Americans in disapproving of the war in Iraq, they also disapprove of the war in Afghanistan, which is not true of the general public. So there is strong disapproval of both of those policies that may have some political consequences. SENZAI: In terms of the 2000 election, it’s interesting that the Muslim community overwhelmingly did support President Bush. There was an effort to organize the Muslim community in some type of bloc vote, and the support went towards President Bush. But yet, after that election, the president did not make positive inroads or engage with the Muslim community – or at least the Muslim community didn’t feel that positive inroads had been made, and consequently, as well as result of the war in Iraq, Muslims overwhelmingly swung to the other side of the spectrum. But please keep in mind this was Arabs and South Asian Muslims that shifted from President Bush in 2000 to John Kerry in the 2004 election. African American Muslims have consistently voted Democratic and continue to do so. For them there was no shift. HAYA EL NASSER, USA TODAY: You found that nearly half of Muslims in the U.S. say they think of themselves first as Muslims rather than as Americans, and you compare that to Muslim attitudes found in other parts of the world. Do you have a comparison on how Christians in the U.S. would answer this question? KOHUT: Scott, the percentages are pretty comparable to what Muslim Americans say. Is that not right? KEETER: It is. Among white evangelical Christians in the United States, an even higher percentage say they think of themselves first as a Christian and not first as an American, compared with American Muslims. EL NASSER: Do you have a number for white evangelicals? LUGO: It’s around 62 for white evangelicals. KEETER: Among Muslims it’s 47 percent “Muslim first” and 28 percent “American first.” Among Christians it’s 42 percent “Christian first,” and 48 percent “American first,” and the evangelical number is in the report. LUGO: And 62 percent of white evangelical Protestants say they primarily identify themselves as Christians rather than Americans. JEFF DIAMANT, THE STAR-LEDGER: [Only] forty percent of the Muslims you polled said they believed that groups of Arabs are responsible for 9/11. As most of the data seem to show increased assimilation and economic success among Muslims, doesn’t that stand out a little bit? KOHUT: It does stand out. It’s a surprising number, but it was a surprising number when Gallup found it in 2002, and we found it again in 2006 when we questioned Muslims all around the world. The percentage among Muslims in America is somewhat higher than it is in other parts of the world, and as I suggested a little bit earlier, some of it may have to do with religiosity: Muslims finding it difficult to believe that Muslims would do such a thing. Some of it may relate to attitudes towards terrorism. JAMAL: Just as Andy pointed out, it’s a big shock to the Muslim community to believe Muslims were responsible for 9/11. So it’s denial, but it’s also pointing to the current misunderstanding that exists between the mainstream society and the Muslim society, because if Arabs didn’t do it, obviously somebody else did. That’s also a very important finding. What does this mean? Do Muslims feel victimized? Do Muslims feel like they’re being framed? It’s much more than just about them not believing real Muslims could do it. It’s, again, more about a deeper misunderstanding between the mainstream and the Muslim community. KOHUT: Back in 2002 when Gallup released its results, the observation was it’s comparable to the fact that the largest majority of African Americans did not believe O.J. Simpson was guilty of murder, which was completely contrary to the views of white Americans. Minority groups have a tendency to try to protect their own and to think the best about their own, and are often quite protective, even in the face of a lot of information that runs counter. You might look at these Muslim results with that perspective. BILL TAMMEUS, THE KANSAS CITY STAR: I have a question about the numbers of Muslims in this country. The estimate the study came up with, just under 2.4 million, is at the very low end of the estimates you normally hear, which range from 3 million to 10 million or 12 million. Could you talk about the methodology you used to come up with that figure, and whether there was debate about that among the research team, and how that got resolved. KEETER: This is a survey-based estimate that has been augmented with an analysis of census data. Let me just describe briefly what the steps were. When I say it’s a survey-based estimate, what we have to work with here is what percentage of all the people we screened, from a national random sample, self-identified as Muslim. All of the survey-based scientific evidence we reviewed is lower than our number. As Andy mentioned, the average of the survey-based incidences have been between 0.2 percent and 0.5 percent. What we got, however, was in incidence rate of 0.61 percent, largely, I think, because we were interviewing not only in English but in other languages. This is a landline telephone survey. We take the incidence number from the landline telephone survey, and we multiply it not times the landline population but times the total adult population because there are people who do not have landlines; they have cell phones – that number is over 10 percent now – and there are a few people in the country, still a couple of percent, who do not have any telephone service at all. We take that into account in the projection. As far as it goes, that number gets you to about 1.35 million or 1.4 million, but we take a second step, which was done by Jeffrey Passel, a demographer with the Pew Hispanic Center. He’s been recognized for his work in estimating the size of the undocumented immigrant population in the United States. He took the survey evidence I’ve just described to you, and also the 59,000 screening interviews we did in which we asked everybody we reached, Muslim or not, if they were born in the U.S., and if not, where they were born; if they were born in the U.S., where were their parents born. He took that information and knowing then what percentage of each of the nationalities we talked to identified as Muslim, multiplied that times the census numbers for the size of those groups. Let’s say eight out of 10 Pakistani Americans that we spoke to said they were Muslim. That could be multiplied times the census data on the size of the Pakistani-born population in the U.S.
We think this is a good estimate. It might be low because Muslims may be more likely to be cell-phone only than the rest of the population. There certainly may be some reluctance to identify as Muslim. We didn’t pick up people who maybe were born Muslim but have lost their identity and are completely secular. We don’t include those. But we think this is a defensible number, and it’s scientifically based. The numbers we reviewed that are 3 million or more do not have a scientific basis in estimation, according to our review of the evidence. KOHUT: This finding is consistent with all the other estimates from non-advocacy scientific efforts. The higher numbers come from groups who are advocates in some way. If you look at the General Social Survey out of the University of Chicago, if you look at Gallup, the numbers are comparable to ours. Ours are a little higher because of the multiple languages, as Scott pointed out. LUGO: I would just add one thing in terms of what we might have missed. We went above and beyond any other survey in the number of languages we used – four – and we think that captures the vast majority of Muslim immigrants, but it’s possible a Senegalese Muslim, for example, may not speak any of those four languages. That needs to be taken into consideration. Our claim is this is the best approximation yet using this kind of instrument, but as we also make clear, as with the estimates that preceded it: “The Pew forecast is an approximation subject to the limitations of the methodology used to derive it.” We conclude that paragraph by saying the results should be interpreted with caution. We don’t want to claim anymore for this than we have solid grounds for doing. TAMMEUS: Would you suggest then that figures advocacy groups come up with, like 6 million, 10 million, are simply wishful-thinking numbers? KOHUT: I will let you draw your own conclusions. We don’t have any insight on their motivations to do what they do. We can only tell you that our surveys and the other non-advocacy surveys produce a range of estimates that are much smaller. Thank you all very much for coming. I appreciate it.